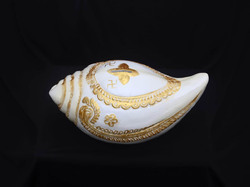 Providing you the best range of fish shape money bank, shankh look money bank in white and golden colour, money bank, nazar battu with money bank, white/ golden money bank and maroon golden money bank with special security with effective & timely delivery. 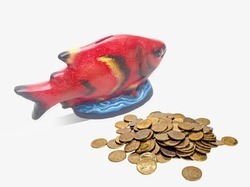 Get the adorable Fish Coin Bank for the young member of your family as a surprise gift and she will be delighted. The charming yellow with brightly colored decorations fish is a coin bank and a decorative collectible as well. The Coin bank is made from fiber material and has a plastic stopper at the bottom for ease of use. Historians have found money boxes that date back to the times. indicating that mankind has been making special Money bank in traditional Shankh look in white and golden color for the safekeeping of coins for centuries. Our money bank Decoration continues this tradition and is one of our most popular handmade Indian gifts for children and adults alike. It is nicely polished and decorated. May be used for keeping your trinkets and money. Best gift for kids and adult. Inspire and teach kids the importance of saving money with this useful décor piece that can hold every type of standard currency coins. Get the adorable-Money Bank for the young member of your family as a surprise gift and she will be delighted. 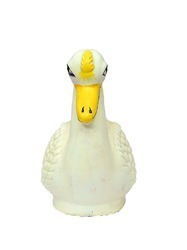 The charming yellow with brightly colored decorations is a coin bank and a decorative collectible as well. The box is made from terracotta clay material and has a plastic stopper at the bottom for ease of use. Money saving is necessary and just decorative accessories for your home . Get the adorable- Nazar Battu With Money Bank for the young member of your family as a surprise gift and she will be delighted. The charming yellow with brightly colored decorations fish is a coin bank and a decorative collectible as well. 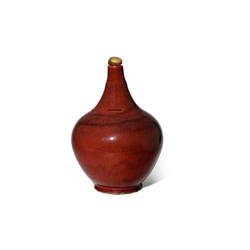 The box is made from terracotta clay material and has a plastic stopper at the bottom for ease of use. Historians have found money boxes that date back to the times. indicating that mankind has been making special money bank with special security feature, white and golden color. the safekeeping of coins for centuries. Our money bank Decoration continues this tradition and is one of our most popular handmade Indian gifts for children and adults alike. It is nicely polished and decorated. May be used for keeping your trinkets and money. Best product for gifting . Historians have found money boxes that date back to the times. indicating that mankind has been making special traditional money bank with special security feature maroon and golden colour. the safekeeping of coins for centuries. Our money bank Decoration continues this tradition and is one of our most popular handmade Indian gifts for children and adults alike. It is nicely polished and decorated. 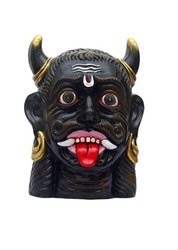 May be used for keeping your trinkets and money. Best gift for kids and adult. Looking for Money Bank ?